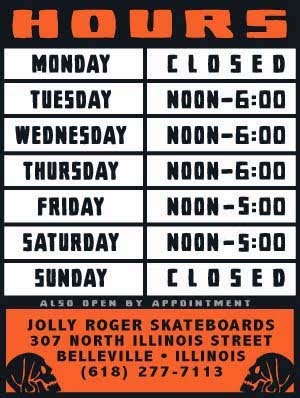 Jolly Roger Skateboards: CCRD TEE PARTY This Saturday! 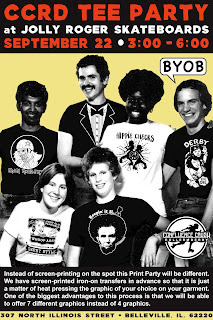 CCRD TEE PARTY This Saturday! Stop by this Saturday from 3:00 to 6:00 for our Confluence Crush TEE PARTY! This time around we are doing it 1970’s T-Shirt Shop style so we will be heat pressing pre-printed graphics on garments instead of directly screen-printing them. *Each graphic will be $3. per transfer during the party(Reg. $5. per transfer). You are welcome to bring ONE of your own tees to put a graphic on. If you would like additional prints we will have tees, tanks and hoodies on hand for sale in the shop. *Either way you will be walking away with a tee for under $10.